I swear, my shop time is so infrequent it takes me forever to complete a project. But I had a decent block of time today and was able to do quite a bit! 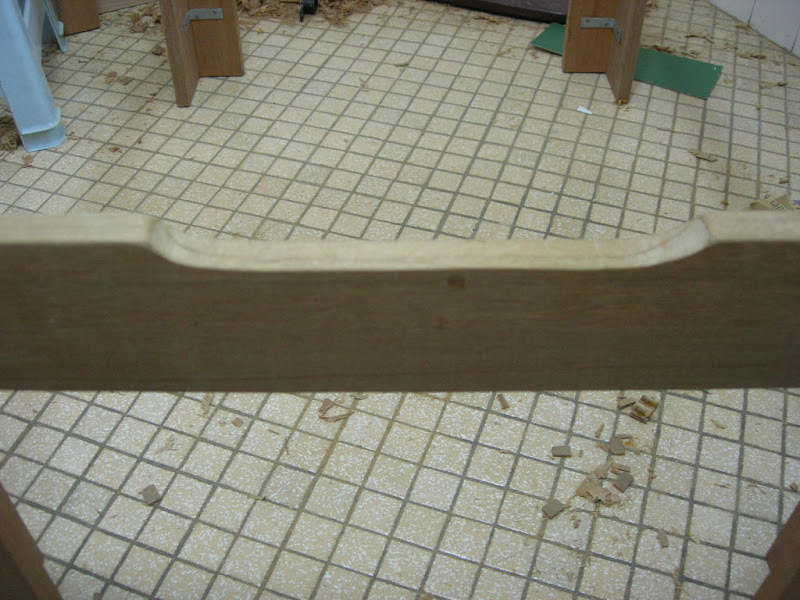 First was to smooth the whole thing down – planing and sanding. Then I had to create a little “slot” in the top of one of the short aprons. This will allow for easy cleanup of legos; you don’t have to worry about clearing the lip, you just sweep them off into the tub through this slot. The technique I used is almost the same as the one I used on my step stool. 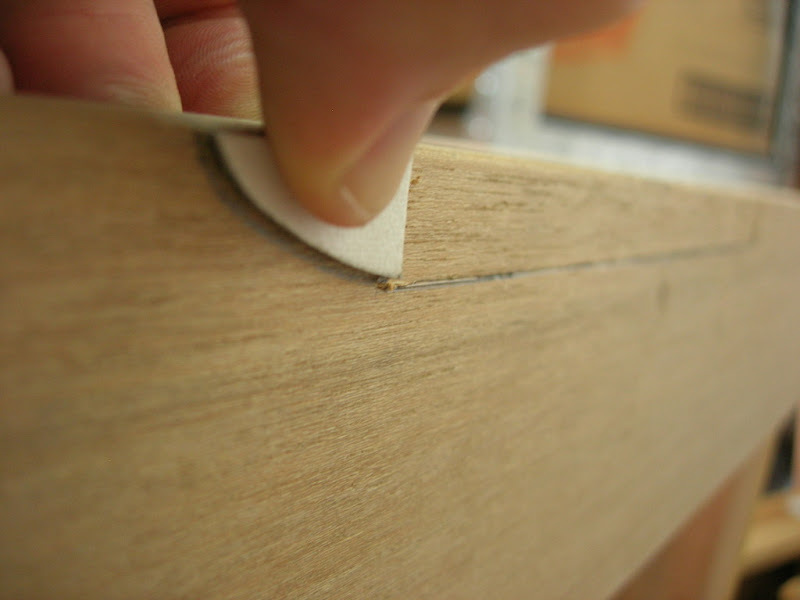 I used a cardboard template to be sure the curves on the ends of the slot were the same. Then I made a series of cuts to the line. It seems tedious but this only took me a few minutes. 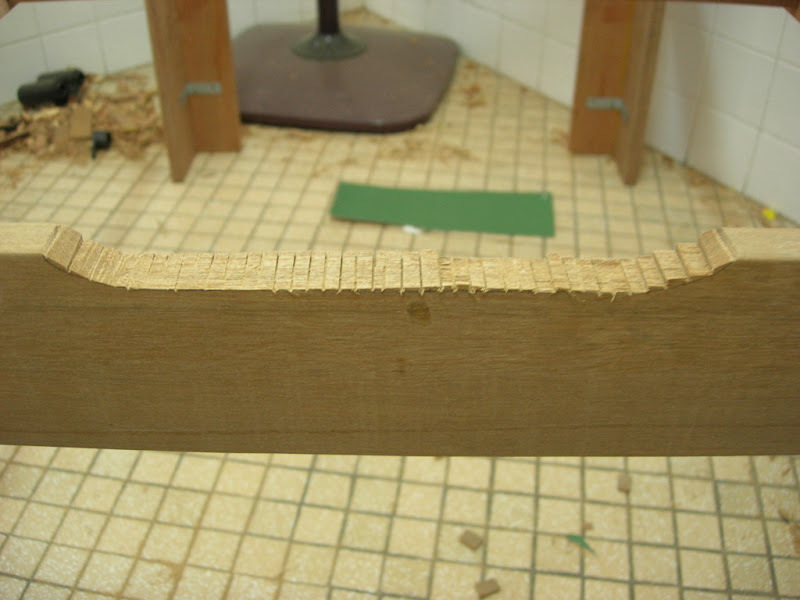 A second pass cleaned it up even more, and then I used a spokeshave and a rounded file (I don’t yet own a rasp!) to smooth it up. Then it was time to finally glue the top on. This is perhaps an optional step but I decided to do it. There isn’t much good gluing surface (mostly the end grain on the legs) so I flipped it over and glued in some glue blocks on the bottom for a little extra support. 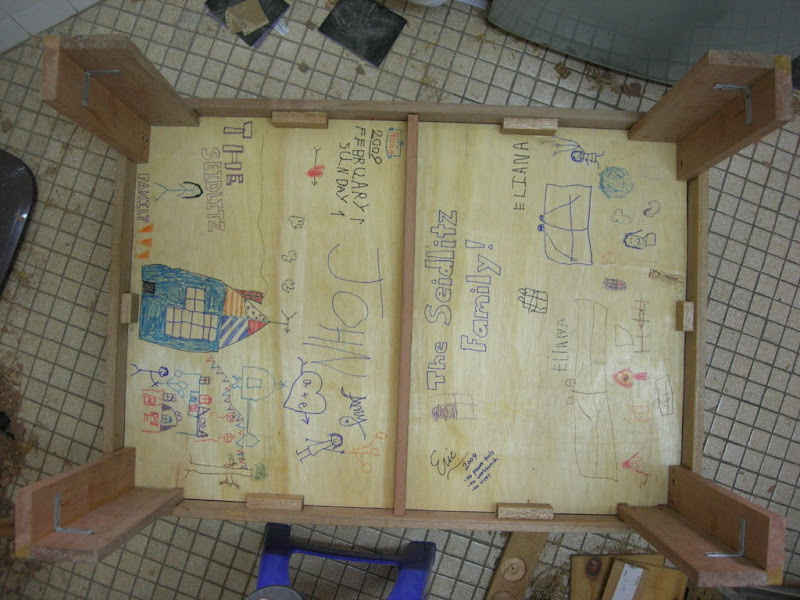 Here’s the underside of the table so you can see what all I’ve done there. 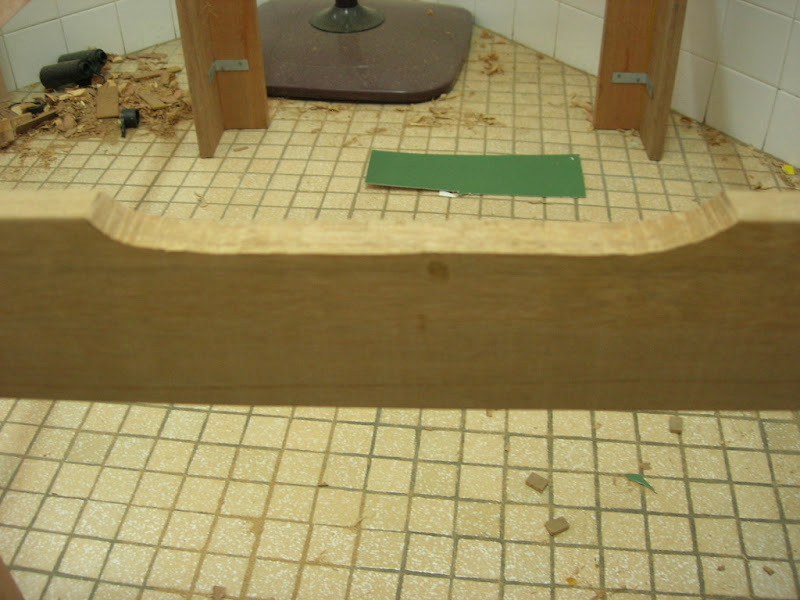 Notice I also nailed in (crude, I know) some brackets to help hold those leg assemblies together. Maybe unnecessary, but I’m paranoid like that. And here she is after one coat of BLO/varnish/mineral spirits (in the midst of drying, thus the uneven look on the plywood). In the morning I’ll buff it out and add another coat, and then tomorrow night one more. That might be it! That looks great Eric! Nice work. I just finished a long project too – it feels good doesn’t it? I’d love to see a shot of the table in use. Tell Amy she should hire you out then!!! We love your end product indeed- very impressive. Especially the hidden treasures underneath. 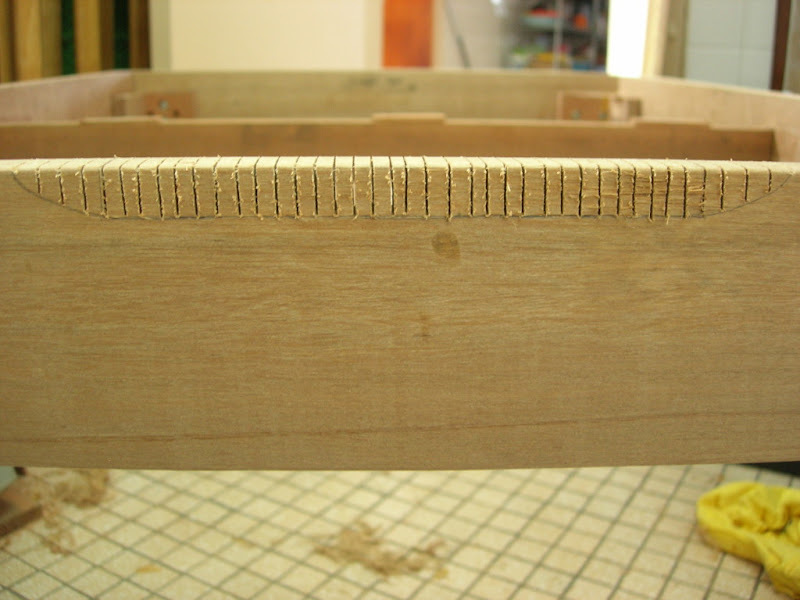 Eric – I just saw your tip on the saw kerf & chisel technique for making concave curves in the latest edition of Woodworking magazine. Congratulations! That’s pretty cool! 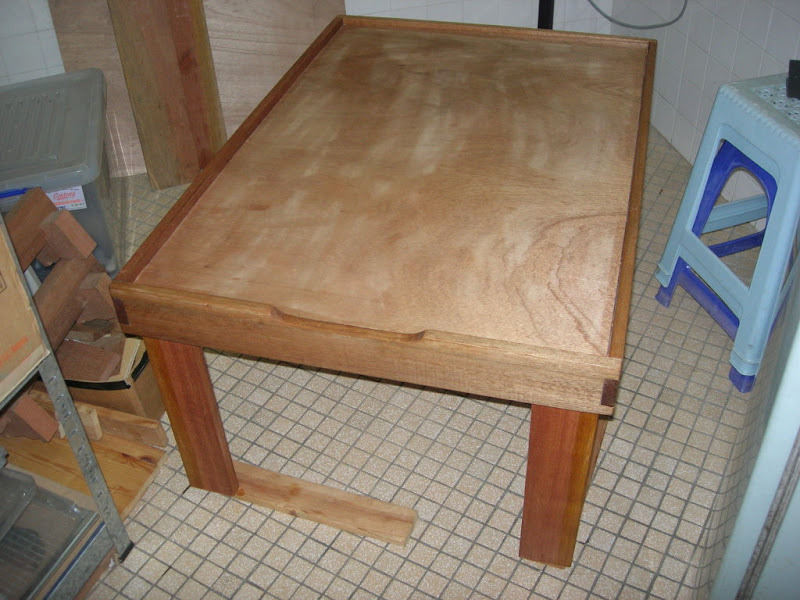 I Know this is an old post – but I’m going to ask anyway – did you paint the top of the table as well? Or was it an existing table you put a new box around?